A controversial proposal to eliminate a cap on the number of taxi permits issued in San Diego is scheduled to be taken up by the City Council today. 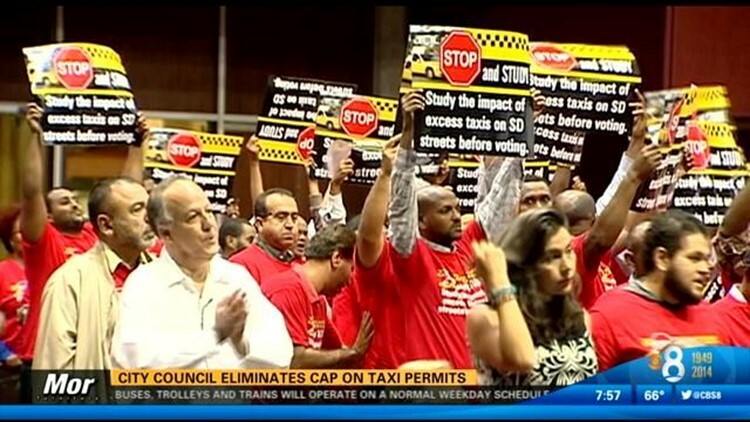 SAN DIEGO (CNS) - A much-debated proposal to eliminate a cap on the number of taxi permits issued in San Diego was approved by the City Council on Monday. The plan passed 8-1 by the council also limits the age of taxicabs to 10 years, prohibits the use of vehicles with salvage titles as taxis, reduces a requirement that a prospective permittee have five years of driving or management experience to six months, and clarifies language regarding citizenship and legal U.S. residency. Supporters of removing the cap on permits, led by Councilwoman Marti Emerald, said the current level of 993 permits creates a limited supply, so they're being resold in an underground market. She said the permits, administered for the city by the MetropolitanTransit System and issued for a $3,000 fee, are fetching up to $140,000 in some cases, and buyers pass along costs to drivers, who have to work long hours at low pay as a result. Sara Saez of the United Taxi Workers of San Diego said 6 percent of permittees drive their own cab, while 69 percent own multiple cars that they lease to other drivers. "According to MTS and Sheriff's Department data, 89 percent of taxi drivers do not have their own permits," Saez said. "So if you're out there in the public and you get a cab, that driver likely doesn't have his own permit." The current set-up forces the drivers to work dangerously long hours, including when they're sick, and discourages them from reporting vehicle damage, she said. Opponents said allowing more taxis on the street will lead to less income for taxi companies already buffeted by competition from new, technology-based services like Lyft and Uber, meaning drivers will make even less money. Taxi permit-holders complain that their new competitors don't face the same regulations they do, though a state law set to take effect next summer will require the ride-sharing services to have insurance coverage and be overseen by the California Public Utilities Commission. The number of permits issued on behalf of the city is arrived at through a formula based on the number of vehicle trips it would take to meet demand. A representative of the MTS told the council members that the base price of a new cab is around $55,000. A larger investment will be required for insurance, a taxi meter, a credit card reader, radio equipment and other gear. Councilman Scott Sherman warned the drivers that it will be tough for them to go into business for themselves. "You're going to find out it's not as easy as you think, but you deserve to have the opportunity," Sherman said. While owners and drivers were at loggerheads on the issue, council President Todd Gloria said the two sides "were in the same boat" when it comes to facing new forms of competition. Councilwoman Lorie Zapf, who believed the changes should be phased in, cast the dissenting vote. The City Council will take Tuesday off to observe Veterans Day.